Have you ever been mistreated, lied to, gossiped about, or hurt through words or actions? Were relationships shattered or broken apart? Did you feel betrayed? I suspect most of us could answer with a resounding yes to one or more of those scenarios. What leads people to tear down others, mistreat friends or acquaintances with words or actions that pierce like small daggers, voice untruths that are vicious rumors or gossip, or criticize because they don’t agree with decisions that are made? I don’t know if there’s a simple answer, but I do believe those who commit these mean-spirited acts thrive on self-created drama that stems from jealousy, lack of contentment, and little self-worth. Before they know it pockets of emptiness and misery creep in and take over their lives. And misery loves company. These poor souls don’t like who they are or what they’ve become. If truth be told I believe they long for a gentler, kinder way of life, but don’t know how to find it. It’s pretty challenging to think of ourselves as blessed when people are doing their best to make our lives unbearable. But know that when we are persecuted it strips away any superficial beliefs, strengthens our faith, and allows our attitudes to serve as an example for others to follow. When we think about our Heavenly Father we know through reading his word that He faced His share of the ‘Mean Girl,’ mentality, only in the form of a man. It’s difficult to think about what Jesus dealt with in His short 33 years of life and how He managed to continually and unconditionally endure, love and forgive those who intentionally hurt Him. But what a powerful example He is for us to follow. How comforting to know that when we are hurt, abused or mistreated, He walks right beside us and holds our hand. We are not alone. I can tell you that I have been the target of a mean girl or two over the years and several of my friends deal with it on a frequent basis. Instinct would naturally drive us to strike back. But we haven’t, and we won’t. Are we perfect? Not even close; but we do know right from wrong. We know appropriate from inappropriate. We also know that if we treat people with kindness, grace, and dignity then we will continue to be a light for Jesus. 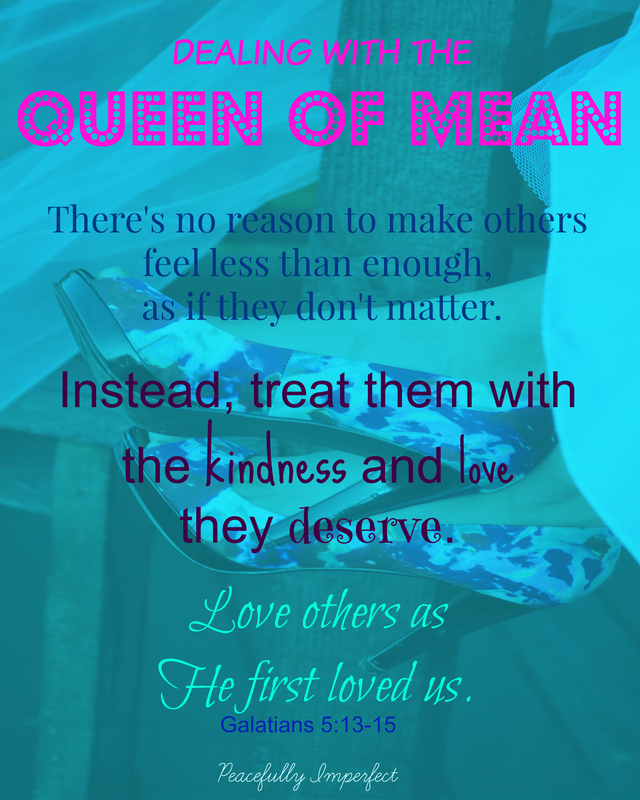 Is it easy to treat others or love others the way Jesus loved us? No, it’s not. But we do know that as women of faith our Lord doesn’t want us to judge others or to complicate their lives and ours with hurtful untruths any more than they already are. We live in a messed up world and the more we become involved in others’ lives, the more we risk heaping unnecessary grief and hurt on undeserving people. Jesus teaches us about loving our enemies in Luke 6:27-28. His word says, “But I tell you who hear me: Love your enemies, do good to those who hate you. Bless those who curse you, pray for those who mistreat you. We must continue to pray for those whose goal in their everyday life is to treat others badly. We must take up our cross and be a model of light for those to follow. We must pray for our enemies and think of ways to help them. We must choose to love our friends and neighbors and extinguish the jealousy and fear that drives the ‘Mean Girls’ mentality. Are you up for it? Mitzi, I love this post. It is one of your best, Now I need to apply some of the principles. I have found myself, in some situations, where I have judged another person on their actions. They didn’t do what I would do. When praying about my frustration, I remembered a quote my mom used to say. It was, ” don’t judge others till you have walked a mile in their moccasins.” Thanks for the reminder. I’ll be praying for you too!! Mitzi, I have been looking for a devotional to read in the morning. I am trying to strengthen my walk with God, and, lo and behold, I found this. Thank you so much!